The high-fat diet of many American children is laying the foundation for future heart and artery disease. In spite of a food supply that is the envy of every third world country on the planet, many American children do not eat well. 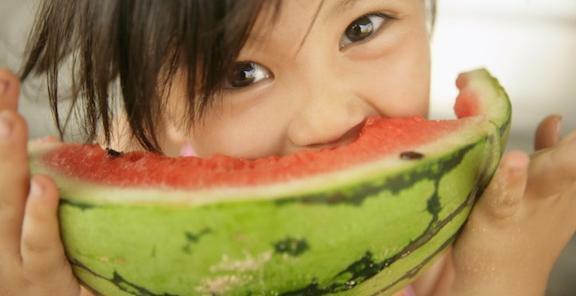 Less than 10% of children and teens eat the amount of fruits and vegetables they should. More than half of U.S. children eat less than one serving of fruit a day, and one third eat less than one serving of vegetables a day and nearly one quarter of those vegetable servings are in the form of french fries. High-fat, high risk: Such a high-fat diet is having serious repercussions on the health of American children. According to the Centre for Disease Control childhood obesity has reached epidemic proportion in the U.S., affecting 21 percent of all youngsters. By the end of their teenage years, virtually all youths have fatty deposits in their blood vessels. “Aortic fatty streaks are universal by the age of 15 and increase rapidly in extent during the following decade,” state the authors of the Pathological Determinants of Atherosclerosis in Youth Study, the largest autopsy study ever conducted on adolescents and young adults. “The results…demonstrate beyond doubt that the foundation of heart and artery disease is laid during childhood, experts said. Beyond that, they indicate that most American youths are at risk for heart disease, not merely a minority of them with certain risk factors.” By their early 30’s, the great majority of men and women involved in this study already had coronary arteries which were narrowed by tough, fibrous fatty deposits, placing them at very high risk for heart attack, stroke or sudden death. A healthier diet, a healthier life: The results of studies such as this have led the U.S. government to revise their dietary guidelines to include all children over 2 years of age. According to the new recommendations, children over 2 should obtain no more than 30 percent of their calories from fat and should ingest no more than 300 milligrams of cholesterol daily. But many researchers and doctors feel these recommendations are too lenient to be effective in lowering cholesterol and reducing disease. Results of the China Health Study, a massive study of 6,500 Chinese designed to identify the connection between diet, lifestyle, and disease, indicate that the standard U.S. recommendation (30 percent calories from fat) is too high. “Our data imply a maximum of 20 percent of calories should come from fat,” says Colin Campbell, one of the leaders of the study. Healthy ‘n’ delicious snacks that kids will love: With minimal effort, you can give your kids delicious snacks and meals that are high in nutrition but low in fat and cholesterol. For something quick, my kids love a large whole grain cracker spread with sesame tahini (or any other nut or seed butter) and layered with thinly sliced cucumber and tomato. Another favorite is a bean tostada: Spread a corn tostada shell with warm refried beans (make sure they have no lard) and layer with shredded lettuce, sprouts, tomato, salsa, and a little grated cheese (optional). For something that can be taken on the road or to school, try rolling the tostada into a warm whole wheat chapati or tortilla. Other good standbys are hot dogs and burgers made out of soy products. Even our next door neighbor’s son, Dane, a picky eater who has recently become a reluctant vegetarian at the urging of his mother, loves tofu hot dogs. Try putting them in a long roll with ketchup, mustard, lettuce, and tomato. My kids’ favorite snack is a mixture of almonds, raisins, dried pineapple and papaya. Vegetarianism gives health and strength: Some people think that children who don’t eat meat, fish or eggs are deprived in some way and that they will suffer from bad health or be weak and malnourished. Children who eat a vegetarian diet are not at risk in this way. Nor are they at risk of being “stunted” in growth. One may look no further than the elephants, giraffes, horses, buffalo and other large vegetarian animals who live only on grasses and leaves to see that vegetarian foods do not stunt the growth of these massive animals. There is no evidence in any of the medical and scientific literature to support any such claim. Rather, the evidence clearly indicates that vegetarian children grow up strong and healthy. You will undoubtedly be doing your children a great service by guiding them away from a flesh-based diet towards a plant-based vegetarian diet.